The HTC Vive is a piece of hardware that allows you to dual wield controllers, waving them about in precise physical space while your eyes occupy some far-flung fantasy world. Does that sound like it might be well-suited for something? Anything? Planning a play session far, far away? Here are the indisputably best Star Wars games. It’s tough to get a feel for how Star Wars: Trials on Tatooine will work from an atmospheric trailer like this one. But evidently it’s about lightsabers, which is absolutely the correct approach. 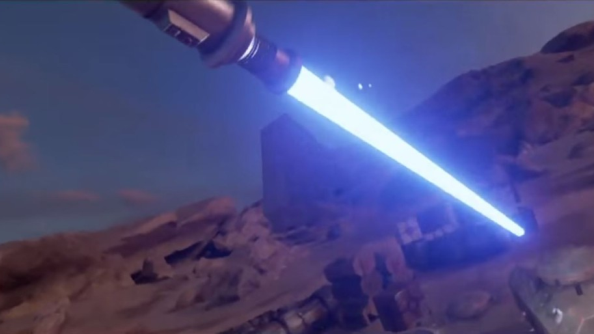 Lucasfilm set up a research and development group called ILMxLab to play with new possibilities for Star Wars, and Trials on Tatooine is one of the results – a “cinematic virtual reality experiment”. I had a go with a basic, first-person zombie shooter hooked up to a Vive last summer. The one-to-one physicality of it is striking – asked to press a button in-game to drop a pistol, I unconsciously loosened my grip and very nearly dropped a controller on the floor. Think you’ll devote a room to your house to lightsaber antics?